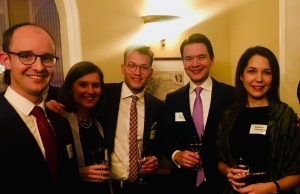 As every year, our Thanksgiving Dinner took place on November 28th at the invitation of the US Consul General in Frankfurt in what has become a long-standing and beloved Global Bridges tradition. Consul General Patricia Lacina hosted the event and invited Global Bridges members and Young Leaders to the Consul residence. After a warm welcome from Dr. Hans Albrecht, Chairman of the Board of Global Bridges, Consul General Lacina opened the evening with a short introduction about her background and professional career. Patricia Lacina has been the Consul General at the American Consulate General in Frankfurt am Main since July 31, 2018, and is responsible for the German states of Hesse, Baden-Württemberg, Rhineland-Palatinate and Saarland. In the ensuing round of discussion and Q&A, Consul General Lacina was asked by several participants about the uncertainty that is currently shaping German-American relations. She emphasized that, in critical times like these, it is more important than ever that Germany and the USA promote dialogue and cultivate their shared relationship. In addition to interesting reports relating to the current situation in the USA, the annual Thanksgiving Dinner is always an excellent opportunity for intergenerational exchange, as many Global Bridges members and young leaders from all over Germany come together to enjoy this traditional evening in each others’ company. Once again, the annual Thanksgiving Dinner was a great success with many lively conversations and delicious traditional dishes served in a festive pre-Christmas atmosphere.